It seems we are now well into September, and that means we're also well on the way to Autumn. Here in the UK temperatures actually worthy of being called 'summer weather' unsurprisingly lasted a measly couple of weeks, but I for one can't bring myself to be too disappointed by it, seeing as Autumn is my favourite season of the year, and September my favourite month. I don't know why, but I always associate the month of September with new beginnings, and it seems many others do to. Perhaps this is rooted in the years and years we spend at school, during which September marks the start of the new school year, a next chapter and time to set an array of new targets for the coming academic year. And I suppose that this mentality has stuck with me. Every year we get to Septemeber, and I feel a sense of renewal, as though I may turn a new leaf, set myself new goals and challenges and embrace the new changes and opportunities that such precipitates. One place I have been manifesting this feeling of change is on this blog! If you've visited my blog before you may have noticed it's undergone a little makeover! How do you like it? Given my renewed sense of enthusiasm I have so much content to share with you this month, so stay tuned! Speaking of new opportunities, September also marks my first time working with a brand. Hawes & Curtis approached me a couple of months ago offering to kindly gift me one of their pieces and of course, I was utterly flattered, especially to be approached by such a well established, quality brand! I'm sure most of you know that the brand specialises in tailoring, (and have done for over a century!) and they currently stock a great collection of women's shirts. Which brings me to this outfit. 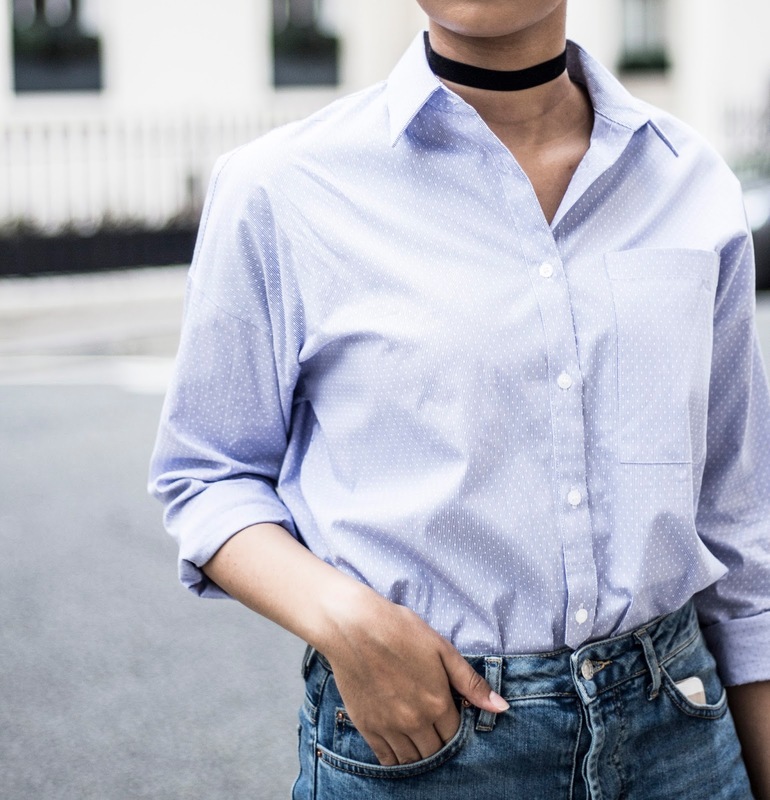 If you think shirts are merely boring workwear, then think again - this season its kinda been all about the shirt, and just how inventive you can be with it. 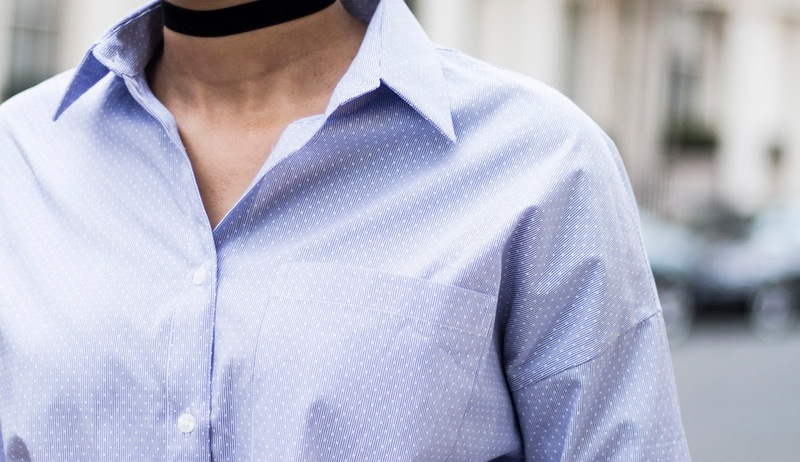 We've seen the fashion pack style the simple shirt in all kinds of ways; I'm talking back to front, bardot style, tied around one shoulder, the works. I haven't been quite so experimental just yet, though as a devoted white shirt wearer, I fancied a bit of a change. 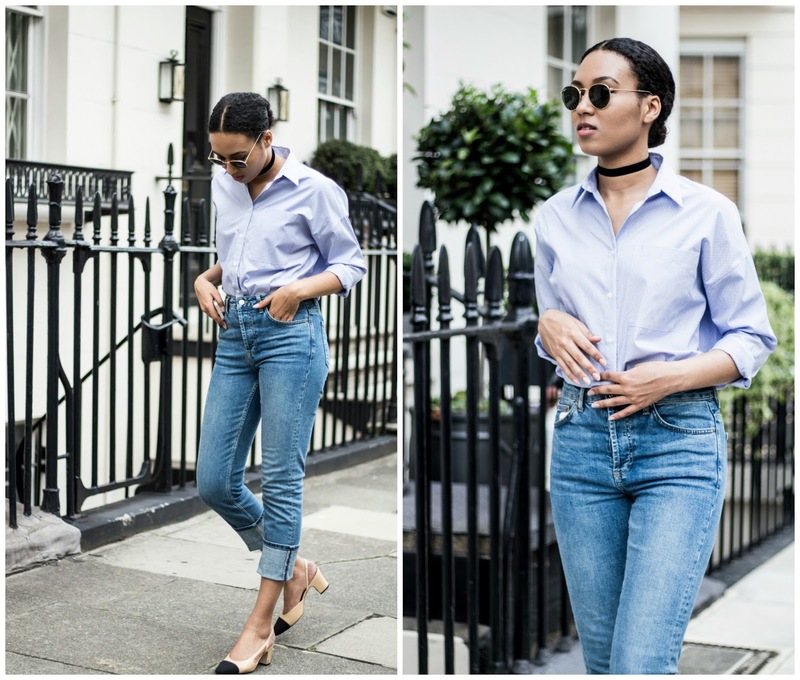 When Hawes & Curtis gave me an opportunity to choose one of their shirts, I therefore opted for this blue number and white number in my favourite style, the oversized boyfriend fit. 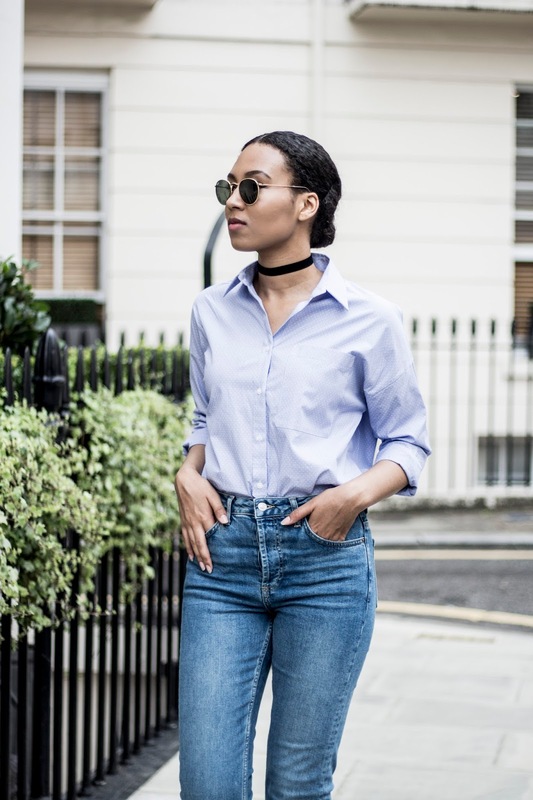 I love this fit as its incredibly versatile; this particular shirt is very long so you have the option of wearing it as a shirt dress or as I have, tucked into some denim. Adding shirts of different colours or patterns will add variety to your wardrobe, but the change subtle enough for easy styling. I've paired it with my straight leg jeans and my fave shoes, my slingbacks. If you follow me on instagram, which you can here (shameless self promo, I know!) then you'll know that I got these beauties for my birthday in June and have been in love with them ever since. My next post will be a review of them, so stay tuned for that! This is such a perfect 'i want to be comfy but also look like I've made an effort' look - the jeans keep it casual, the shoes keep it trendy yet classic, and the shirt adds an element of smartness. 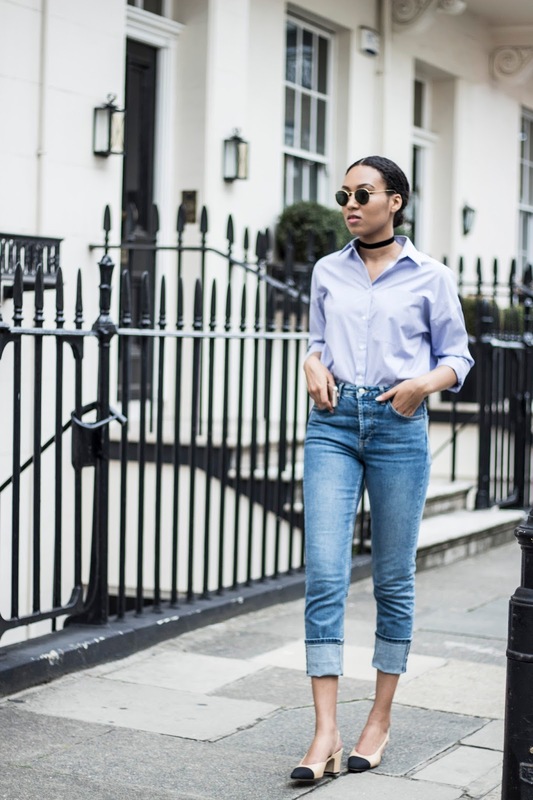 Are oversized shirts a staple in your wardrobe? Leave me your thoughts on this outfit in the comments below! Please note that whilst I was sent this shirt to style, this post is not sponsored and all thoughts/opinions are my own. *P.S. I can't actually believe I'm typing this, but from now on I thought it right to add a 'disclaimer' to my blog, so you might gage my approach to working with brands. You can read it here! My, do I feel professional... who'd have thought I'd be here having to write a fancy disclaimer, eh? 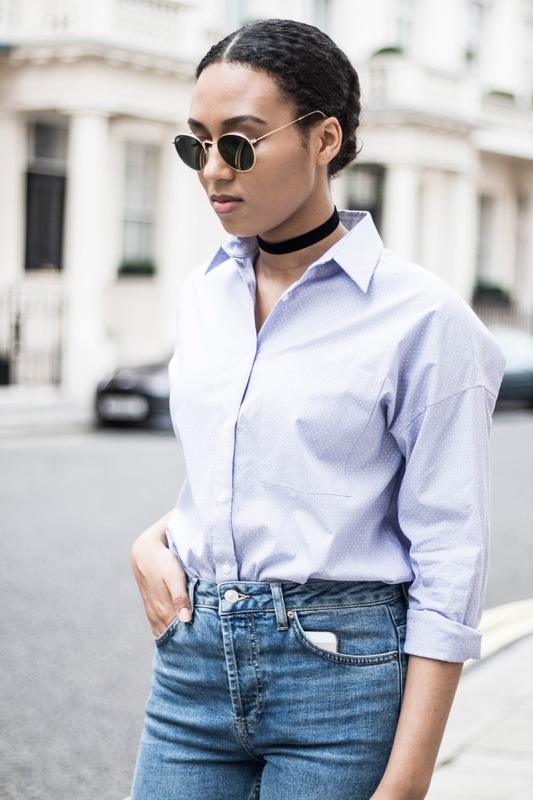 Oversized shirts are definetley one of my wardrobe essentials, i have to have a good selection an i constantly add to it, i love this one and how youve styled, perfect for september vibes!